When temperatures soar, the hottest place in the country is often Gravesend. What is it about Gravesend that gives North Kent the edge in the heat stakes? I've long wanted to visit and find out, and yesterday gave me the chance. 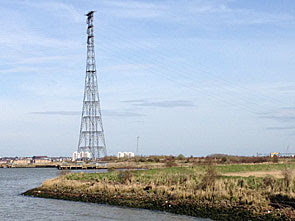 The elusive weather station is actually located about 300m into the borough of Dartford, on the Swanscombe Peninsula, close to a bend in the Thames at Broadness. It's nowhere easy to get to, sited across acres of lumpy marshland, and very nearly in Grays. But you've quite probably nearly been without realising because High Speed 1 emerges close by, immediately before arriving at Ebbsfleet International on the way to Ashford, Paris or wherever. I decided to approach from Greenhithe station, and the new estate at Ingress Park. This is so new it's not on my 2001 Ordnance Survey map either, built in the grounds of a former palace overlooking the Thames. For a newbuild site it has genuinely attractive character, at least in part, although the blocks running alongside the river are rather less appealing. Apartments are nudging inexorably east onto the marshes, although step beyond along the sea wall and the land suddenly opens up. A wild space of undulating grassland lies ahead, the path sticking close to the river to avoid dips and drops inland. In places the Thames laps up close, in others rubbish and detritus litter the foreshore. That pylon in front is one of the tallest in the UK, an impressive 670 foot high, and is used to carry electricity cables high over the Thames to Thurrock. Apart from the occasional twitcher and dogwalker, I think I had the entire square mile to myself. Various paths and tracks wind through the peninsula, and it wasn't always easy to tell which were the official rights of way. But at a junction with wires fizzing overhead I took the left-hand fork, crossed the brow of a 'hill' and there was my goal. The track led down to a small scenic inlet of moored-up boats, and beside that some sort of radar mast, and beneath that the Broadness weather station. Some of the boats looked like they might be semi-inhabited, so I approached with caution because this is the exactly the sort of place where you'd keep two loose alsatians. But no, the place seemed deserted and I could wander up to the Stevenson screen unchallenged. The record-breaking box stood behind a protective fence labelled "Port of London Authority - Authorised Access Only", with its own anemometer spinning to one side. So why does this particular spot so often top the mercury? Some say the adjacent marshes have a sandy soil which retains the heat, but in fact most of the immediate area is water thanks to the Thames bending by. Others blame an embankment immediately to the east, which is certainly too high to see over, but the site is generally wide open to the elements. One climate-change-denying blogger blames pylons and masts nearby, but he's never been, and I can assure him there's no noticeable warming effect. 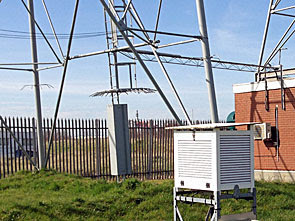 Instead the Met Office merely point to the fact that they have very few recording sites around London, and only this one to the east, so it's not surprising it often records a unique temperature. Yesterday afternoon, checking the Met Office app on my phone, I discovered that the temperature being recorded immediately alongside was 17°C. Not bad for mid-March, but in this case not as good as the 19.3°C reached in St James's Park. Alas everywhere I'd just walked, indeed the entire Swanscombe Peninsula, is currently under threat of total eradication. Paramount Pictures intend to build a vast theme park here, a rival to Disneyland no less, which they hope to have opened by 2019. Plans remain sketchy, but are likely to include Europe's largest indoor water park, various film-related rides, music venues, cinemas, hotels - basically anything and everything the promoters can cram in. The site's ideally located close to good roads and Ebbsfleet International station, which'll draw in punters from across England and abroad. The landscape may feel remote and special today, but few will complain if the marshes vanish. They're only post-industrial landfill anyway, hence ecological protests are sure to be trumped by investment hopes and employment opportunities. Imagine Shrekworld, an Indiana Jones rollercoaster and the Star Trek Intergalactic Experience, all within easy reach of London and France - how can it fail? Plus the weather'll be fantastic. I made a bit of a mess of reaching my next destination. Escaping from Swanscombe Marshes proved difficult because the most direct exit was flooded, then the alternative path I took ended at a locked gate. I then got to hike through the town of Swanscombe three times because of conflicting information from the council and (bloody) Google Maps. At one point I was a few hundred metres away from where I needed to be, then made the mistake of opening up my "Discover Dartford" tourism leaflet which listed an incorrect location 30 minutes walk away. And so I ended up on a far-flung lane on the edge of a chalk pit, where an entire slope of churned earth was being made ready for its first access road in preparation for housing. I took a photo just in case, then returned back in defeat to almost where I'd come from. Imagine my surprise yesterday when I switched on the news to hear George Osborne trumpeting the creation of Ebbsfleet Garden City like it was some fantastic new initiative. Not so. Plans have been afoot since 2002 to fill the enormous chalk quarry next to Bluewater with housing, but development thus far has been really slow due to lack of investment. That earthy slope I'd seen was one of the initial manifestations, with construction of the first 150 houses now finally underway. Expect spacious plots with green infill and a view obscured by white cliffs... but a freshly enabled "Garden City", I think not. All this time I'd been trying to 'like' Swanscombe, and failing, thanks mostly to its inhabitants. A posse of rippled youths swaggered down one street with two off-leash Staffies trotting ahead. A young couple stormed out of their local convenience store after muttering something racist and waving two fingers at the Asian shopkeeper. A mother in a corner terrace yelled repeatedly at her kids to stop effing about in the front garden. And just as I thought I was perhaps being prejudicial and snobbish, a lad wearing a hoodie with a fag behind his ear and a can of lager in his hand walked past... and farted. I suspect house prices are relatively low in Swanscombe, but I'd think twice before moving in nextdoor. One of the benefits of a landscape full of quarries is the opportunity for the past to be dug up. So it is at Swanscombe, the first place anywhere in the world where Portland cement was commercially produced. Barnfield Pit was once linked to the cement works via a tramway (still sort-of visible in Craylands Gorge), and it was here in 1935 that a great discovery was made. An amateur archaeologist looking for flint tools found a fragment of Palaeolithic skull belonging to a young female, now inappropriately known as "Swanscombe Man". The following year a perfectly matching fragment was found nearby, and 20 years later a third, assembled to form an astonishingly rare relic. The Swanscombe skull dates back 400,000 years to the early Stone Age, and is one of only two such ancient human remains ever found in the UK. Such is its importance it now lives in the Natural History Museum, while Dartford Museum has an informative replica. Swanscombe Heritage Park is best accessed via the community centre on Craylands Lane. A giant sculpture of a stone axe has been plonked at the main entrance, well worth a photo, then a paved trail leads down into the pit. It's all very nicely done, with informative metal plaques embedded in chunks of rock on the way, well worth a read. There are also tiles in the ground depicting animals (such as straight-tusked elephants) that used to live here when the Thames flowed by. Before long I'd dipped beneath the level of the surrounding football pitches to follow a path between the trees into a nature reserve. I had hoped to have Barnfield Pit to myself but no, half a dozen Swanscombe boys were playing in the clearing, riding bikes and generally running amok. Thankfully they were much politer than those I'd encountered in the town, but they still looked on somewhat bemused as I attempted to read the "First Part of the Skull" monument. The plaque for the second part appeared to have been stolen, at which point I gave up and departed back through the trees. An evocative spot, for sure, but best shared only with 400,000 year-olds.